N. Coleby (ed. ), A Surreal Life: Edward James 1907-1984 (ex. cat. Royal Pavilion, Libraries & Museums, Brighton & Hove in association with Philip Wilson Publishers, 1988), cat. no. 49, p. 132, b/w ill. p. 131. Few photographers epitomise the glamour and beauty but also the shifting fate of the twentieth century better than Cecil Beaton. Rising to fame in the Roaring Twenties as part of the Bright Young Things, Beaton’s career matured into one of unrivalled prominence. Royalty and stars of the silver screen supplied his subjects later in life when he enjoyed access to a world of phantasy-paradise, partially of his own construction. Beaton’s sphere was one of beauty and elegance, comfort and repose, frivolity and opulence. However, his instinctive ability of drawing out the intense humanity of his subjects and his eye for drama were repurposed to great effect during the Second World War. Shots of the devastation wrought on Europe as well as scenes on dispatch in North Africa and China showed Beaton’s ability to represent, with compassion and courage, a dirtier, more troubling aspect to his artistic vision. This portrait of Edward James, like many of Beaton’s studio portraits, is unashamedly self-conscious and constructed. James holds a frame around himself. The fabric within it, when paired with backlighting, forms a bright sheet. 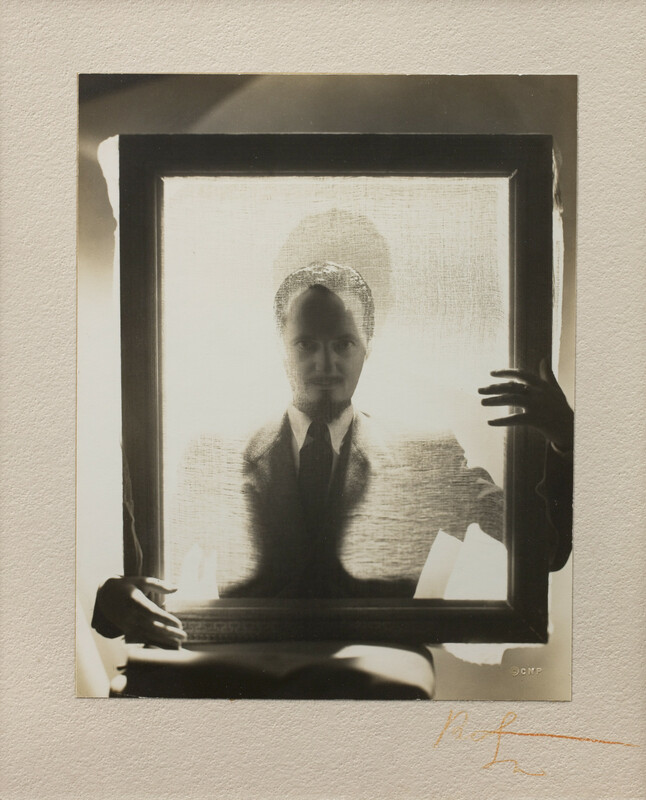 Only the sitter’s face is revealed in shadow while his gestural hands emerge eerily from behind the frame. A similar technique is deployed in Beaton’s portrait of Aldous Huxley made in 1936. Beaton and Edward James were known to one another during the 1920’s but their relationship was made closer by James’s marriage to the Austrian dancer Tilly Losch in 1930. Beaton had been friends with Losch several years since she toured to Britain with Max Reinhardt’s theatre company. Using the substantial fortune inherited from his father, James financed his wife’s acting and dancing career, and commissioned Paul Nash to design her bathroom in 1932 which featured the extensive use of mirrors. Throughout the thirties James became an increasingly important patron of the surrealists and in 1937, following the International Surrealist Exhibition in London the preceding year, he commissioned three canvases from the rising surrealist, Rene Magritte who had been staying at his London home on Wimpole Street. These canvases were then installed behind two-way mirrors in the Robert Adam-designed ballroom. When a switch was flicked, the canvases would appear from behind the mirrors. The same year Magritte painted two portraits of James, ‘Not To Be Reproduced’ and ‘The Pleasure Principle: A Portrait of Edward James’, both of which obscure the sitter’s face, one by a mirror which reproduces the artist’s perspective of the back of James’s head rather reflecting his face, and the other by a bright effusion of light. Beaton would have been familiar with James’s home and these paintings: his portrait conversely chooses to divulge James’s physical identity and directly involves the sitter in the act of framing and presenting it. We are met with a stern gaze which ought to, through direct eye contact, frankly reveal James’s character. However, we meet him as it were ‘through a glass darkly’; his gaze is adulterated by the haze of fabric and self-conscious artifice which mediates it. The high contrast of Beaton’s image renders it searing and impactful to the eye, but James himself remains shrouded in the mystique and glamour that Beaton so ably portrays. Despite James’s separation from Losch in 1934, Beaton remained closely associated with him, and his social set which included the Mitford Sister and the composer Lord Berners, throughout the rest of the decade and into the forties. Taken for Vogue between official war assignments abroad, this photograph presents their enduring friendship and mutual artistic admiration, a nuanced image that combines Beaton’s deeply informed, cerebral capacity with his flair for drama and performance than made him the most memorable photographers of his age. Beaton was born the first of four children to a wealthy timber merchant. He was schooled at St Cyprian’s, Eastbourne, where George Orwell and Cyril Connolly were contemporary pupils, before attending St John’s College, Cambridge. Beaton’s days at university were dominated by theatrical pursuits – stage and costume design as well as acting – and he left Cambridge in 1925 without receiving a degree. By 1927 he signed his first contract with Vogue magazine, shooting debutants and becoming influenced by the American photographer there, Helen MacGregor. Just the following year he first travelled to New York, then Hollywood establishing a network of illustrious friends and collaborators that would expand to include Gary Cooper, Greta Garbo and Marlene Dietrich over the next few years. The period leading up to the war brought further success with Royal commissions (beginning with the Duke and Duchess of Kent) clashing with controversy surrounding Wallis Simpson who he photographed on several occasions. Pablo Picasso, Augustus John, Gertrude Stein, Henry Moore, Stephen Spender, Coco Chanel, Salvador Dali, and Aldous Huxley are some of the eminent artistic figures he made portraits of during this period. The Second World War saw him travel extensively through India, China, the Middle East and North Africa on military service, while still finding time to continue with work designing for stage and screen and enjoying civilian life at ease in America. When peace returned Beaton consolidated his position as the preeminent photographer of high society through extensive work with the British Royal Family and with newly emerging stars such as Marylin Munro and Audrey Hepburn. His career continued to expand into new territories, absorbing sixties culture and mirroring his early work in an act of personal refraction that underscored both the novelty of his latest work and the importance of his previous cultural contribution.